“What do I do with these, Mom?” Karma whispered to her Mom as she took the petals from the red roses being passed around and cradled them in her palm. “Throw them on the grave when I throw mine, sweetie,” Sarah whispered back. “How ironic that they’re red roses,” Sarah thought to herself as her mind started to wander back to a day some thirteen odd years ago. She was in her early thirties then, and had finally met the man of her dreams – Sheldon. Theirs had been a whirlwind courtship. They seemed so right together – they seemed to have it all, same background, same values and loads of passion. Sarah was ready to believe in his dreams and encouraged him to go after them. Sheldon was so happy to have finally met someone who would support him in his art. His ex had insisted that he stick to the law firm and even pushed him to try for a partnership in it. He hadn’t had that kind of encouragement before, he confessed to Sarah. They discussed a possible future together. Sarah was mentally prepared to support them, while Sheldon focused on his art studies. Sarah was also ready to move to Mumbai, knowing that his chances of success were better there. That day in May, she was happy to be visiting Mumbai on work. It meant that she got to spend time with Sheldon. It also meant that she would be able to tell him her big news. He picked her up from the guest house and took her to Church. After Mass, he stopped to buy some roses. A whole big bunch of roses. As he stepped back into the car, Sarah was so thrilled. Could this be the day he was going to formally propose to her? But he placed the flowers on the dashboard without a word. “I’m taking you home for breakfast,” he said. When they reached his home, he took out a single flower from the bunch and absentmindedly gave it to her. Sarah was puzzled, wondering who the roses were for. It was only when he presented them to his mother, that she realized it was Mother’s day, and felt a little foolish. But she held on to that single rose, still hoping for that proposal. ‘Next year, he’ll just have to give me a fantastic bouquet,’ she smiled. Standing here today, she wondered for a brief moment whether she had made the right choice back then. But then good sense took over. Her life since that day hadn’t been easy but she had lived with dignity and with a lot of love, joy and laughter too. 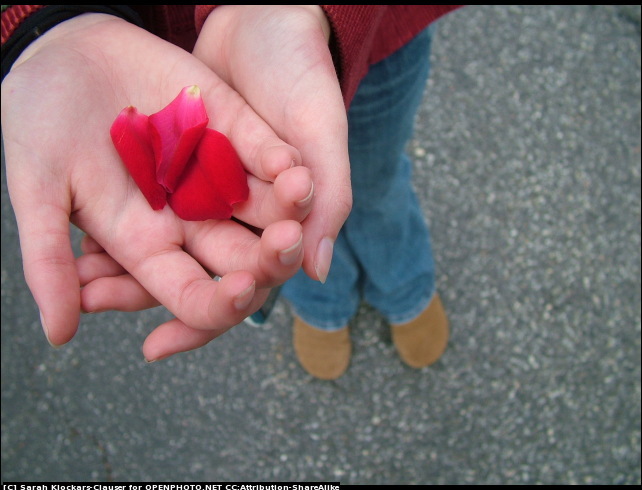 The service was getting over and she threw the petals, nudging her daughter to do the same. Then taking the girl’s hand she turned and left the cemetery. Well, nothing quite prepared me for the end. Beautiful, sad…..but beautiful. If only people live knowing Karma is gonna get them whenever she can, happiness would not be a butterfly. Wonderful story Corinne.The grace and dignity of Sarah has come out beautifully through the narration. That was a well woven srory, I really wish that Sarah had reasoned with Sheldon, then their life would have been so different. Touching tale! And Karma it was!! Beautifully narrated…. The story depicts strenght of a woman, her dignity, her pride!! It also reflects on the pathetic mindset of males in our society…he deserved this!! Just due to the reason that one may not give birth they have to sacrifice love ! Karma has her way of coming around when you least except it. Such a beautiful story, Corinne! Loved it. A wonderful story Corinne. Very nicely written. Short, crisp and neat…loved the story, Corinne. Beautiful corinne ! loved every bit of it ! we never know in life, how some decisions can create consequences one could never dream of…. thanks for sharing such a lovely post ! I am proud of you !! I just loved all the 3 characters sarah, sheldon and karma. They so perfectly depict our lives. Sarah for strength and dignity, sheldon for stupidity and confused and karma for innocence. Story was worth reading…..Thanks Corinne for posting it…. Oh Corinne ! Superb story ! Excellently told. You had me gripped till the end ! Very well written….All the best! good story Corinne and aptly titled too. Keep writing. I hadn’t guessed the end at all. Superbly narrated. So difficult to know what decisions work in life and what don’t! So well written. I believe in Karma too in that it comes back to bite you at some point in time. Sheldon got what he deserved. If Sarah had told him about the child, maybe life would have been different for both. But then, why should she when he doesn’t care about her feelings at all. Lovely! Wow! What a story. Loved it every bit. And I loved how you named the child Karma. Guess, Sheldon got what he deserved. The kinda story that brings a lump to my throat! I had goosebumps reading this… You’re such an amazing writer! Perfect ending BS. Such a beautiful story! Such irony, isn’t it? Wow! That was such a beautiful story. It spoke tons! Specially when I am going through this phase of making choices and letting things that are dearest, go off! Guiding it is. Life is all about choices I guess and this story just re-emphasizes on it…. Yes, it’s truly all about choices – and learning to accept that we might have made bad ones, accept and move on too. Interesting twist at the end. What a jerk! These days, thirty is not too old to have children . . . obviously. Sadly, they still make men that way though, Joyce! Karma will also win! Good one Corinne. T.
Karma sure has a way of winning. Thanks, Talya! Corinne, your stories just get better and better! I hung on your every word and the ending was perfect! Thanks so much, Martha. I just told Ron how scared I am about publishing my stories – they never feel good enough. When a storyteller like you tells me you liked it, I makes me feel wonderful! Thanks again. A beautifully woven story Corinne. Ironic and a metaphoric gem. Corinne, That was touching, awesome and the most beautiful story I have ever come across. Gave me peace. Thank you… thank you soo sooo much. Karma. Keep chanting. Karma. I’m so glad it ‘spoke’ to you, Punam. Corinne ,this is such an emotional story!! Sarah’s unspoken grief is is so touching. I’m glad it touched you, Mrs Menon. I’m looking forward to reading your take on the prompt. Speechless Corinne. Really a wonderful story. Karma has a way of getting back at you. A very poignant tale. I hung onto every word. Oh yes, Karma comes back to bite you, if you’re not careful! 😉 Glad you liked this story, Suzy. We can plan all we want but we really don’t know what life has in store for us. Sarah is all grace, strength and warmth. Loved it. Such a nice story. Sad that Sheldon never came to know about Karma. I like the character of Sarah a lot! Glad Sarah’s character came through, Kajal. Don’t you think Sheldon got he deserved? I am not sure Corinne. Sheldon definitely had his reasons and Sarah accepted that. I don’t know if he deserved it. When he put his points across to Sarah she could make him understand her point of view as well, but she meekly accepted what was fallen on her. I may be wrong too, but I guess when we make the choices (like Sarah did to accept quietly whatever fate had) then there should not be any reason for us to complain. Of course that is what I liked about Sarah’s character is that she did not carry any grudges and moved on with her life. Also she did not let the incident affect Karma’s life in any way. Hats off to the woman, though. Hmmm…I get it. We all make decisions which we can always second guess – but if they’re based on some sound principles, then we get the strength to live by them. Thanks, Kajal.